Initially we made our own wine in the old dairy with the help of the very talented wine maker Emma Rice. 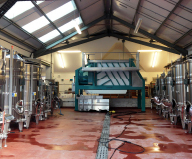 It soon became apparent that we were outgrowing the small micro-winery, so we were invited to join forces with Hattingley Valley, another Hampshire sparkling wine producer. Their winery is a Titan amongst English wineries and visitors from as far as Rheims in France have been known to visit this extraordinary example of modern winemaking. 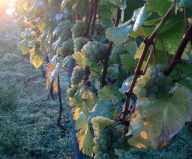 The three grape varieties we use are Chardonnay, Pinot Noir and Pinot Meunier. Each variety has its own personality. 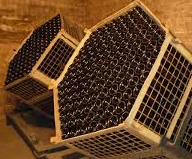 The final sparkling can be made from each individual variety, or from a blend. Chardonnay is elegant, fruity and fresh, whereas Pinot Noir brings body and structure. Pinot Meunier rounds off the other two when blended. It has been described as the glue that binds the whole blend together. 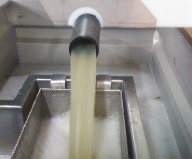 The grapes are pressed using a Coquard press, which is very gentle – just what’s needed to produce great sparkling wine. The grape juice is then fermented in temperature-controlled tanks, or in second-hand barrels, and left until the following year when it is bottled along with additions of yeast and sugar. At this stage the wine goes through a second fermentation in the bottle known as Méthode Traditionelle). This is where the fizz comes from! When the second fermentation is finished the bottle is placed on its side and the now dead yeast settles to the bottom of the bottle and starts to degrade. This process is called autolysis. During this stage the wine acquires some interesting flavours, for example, burnt toast, brioche, bruised apples etc. After a few years the bottles are placed in a riddling machine, which riddles all the dead yeast into the neck of the bottle. The neck is then dipped in liquid nitrogen which freezes the dead yeast and a small amount of wine in the neck. The frozen portion is then extracted and replaced by the liquor d’expedition/dosage. This could be the same wine with a touch of sugar, an older vintage, a bit of Armagnac, strawberry essence or what ever the winemaker chooses within reason. Each sparkling winemaker has their own recipe! And then... Pop! It’s ready to drink!